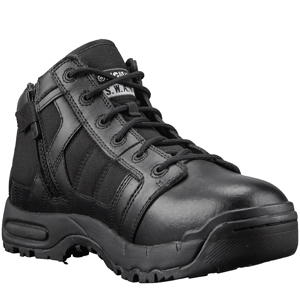 For the everyday officer looking for safety, comfort, and performance in a shorter package, Original SWAT Metro Air 5in Side-Zip Tactical Boot 123101 is the tactical duty boot for you. This hot weather boot features a full grain leather and denier nylon upper. A polishable heel and toe makes it easy to maintain an inspection appearance at all times. An unlined upper allws for breathability and cooling. A convenient side-zipper in durable Vislon pattern for easy on and off fit and includes a low profile hook and loop tab-stay closure. Enjoy maximum comfort with a custom-molded phylon EVA midsole for lightweight comfort and cradled support and Texon stability platform for lateral support and torsional rigidity. Instead of a steel shank, this tactical boot features a heavy duty nylon shank for safe use around x-ray machinery and in airport settings. Built to perform in all environments, the Metro Air boot provides excellent comfort while look inspection ready even at the end of your shift.